Over the past decades there has been a resurgence of interest in Chekhov's acting technique. The original publishers of his fundamental text, To the Actor, removed most of the author's references to Rudolf Steiner, but recent studies acknowledge Chekhov's personal interest in anthroposophy as the source of his artistic inspiration. Dawn Langman explores the fundamentals of Chekhov's psycho-physical technique and the metaphysical principles on which it is based. She examines this technique in relation to the specific challenges and gifts provided by the actor's constitution of body, soul and spirit, and in the context of the canon of great poetic and dramatic texts - illuminated by Steiner's insights into humanity's evolving consciousness. The Art of Acting lays the foundation for the second and third books in her series, in which Langman explores Rudolf Steiner's art of speech and its integration with Michael Chekhov's methodology. 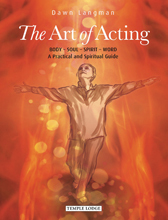 Together, these books offer a contemporary, spiritually-enlivened path of development for the actor, in which the combined insights of Steiner and Chekhov lead to new possibilities for the performing arts. DAWN LANGMAN undertook a mainstream speech and acting training in Australia, followed by seven years of performing and teaching at secondary and tertiary levels. Her quest for an integrated approach that includes the spiritual dimension led her to train with Maisie Jones at the London School of Speech Formation in the method developed by Rudolf and Marie Steiner. She then taught for ten years at Emerson College in Sussex. Following this, Dawn trained in Michael Chekhov's acting technique with Ted Pugh and Fern Sloan of the Actors Ensemble in New York. Returning to Australia, she founded the School of the Living Word, where for eight years she continued to research the integration of Speech Formation with Chekhov's technique. She currently teaches this methodology at the Drama Centre, Flinders University, South Australia.